Travel Back to an Early Clinton Scandal Voters have the impression Hillary isn’t trustworthy. She’s been reinforcing it since 1993. The question came up this week at a political panel: Why don’t people like Hillary Clinton? Why do they always believe the worst? Why, when some supposed scandal breaks and someone says she’s hiding something, do people, including many of her supporters, assume it’s true? 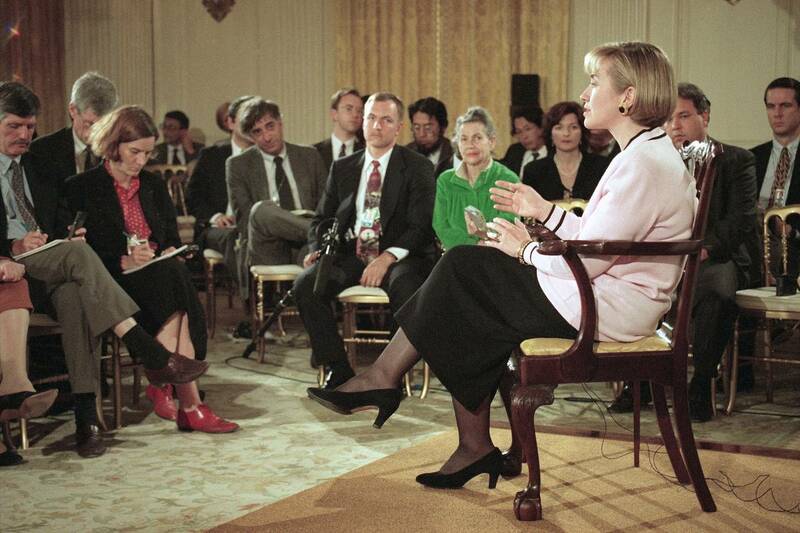 The answer is that Mrs. Clinton has been in America’s national life for a quarter-century, and in that time people watched, observed and got an impression of her character. If you give the prompt “Clinton scandal” to someone under 30, they might say “emails,” or Benghazi” or “Clinton Foundation,” or now “health questions.” But for those who are older, whose memories encompass the Clinton era, the scandals stretch back further, all the way to her beginnings as a national figure. Seventeen years ago, when word first came that Mrs. Clinton might come to New York, a state where she’d never lived, and seek its open U.S. Senate seat, I wrote a book called “The Case Against Hillary Clinton.” It asserted that she would win and use the Senate to run for president, likely in 2008. That, I argued, was a bad thing. In the previous eight years she’d done little to elevate our politics and much to lower it. So I laid out the case as best I could, starting with the first significant scandal of Bill Clinton’s presidency. It is worth revisiting to make a point about why her poll numbers on trustworthiness are so bad. It was early 1993. The Clintons had just entered the White House after a solid win that broke the Republicans’ 12-year hold. He was a young and dashing New Democrat. She too was something new, a professional woman with modern attitudes and pronounced policy interests. They had captured the national imagination and were in a strong position. Then she—not he—messed it up. It was the first big case in which she showed poor judgment, a cool willingness to mislead, and a level of political aggression that gave even those around her pause. It was after this mess that her critics said she’d revealed the soul of an East German border guard. The Clinton White House was internally a dramatic one, as George Stephanopoulos later recounted in “All Too Human,” his sharply observed, and in retrospect somewhat harrowing, memoir of his time as Mr. Clinton’s communications director and senior adviser. He reported staffers and officials yelling, crying, shouting swear words and verbally threatening each other. It was a real hothouse. There was a sense the gargoyles had taken over the cathedral. But that wouldn’t become apparent until later. On May 19, 1993, less than four months into the administration, the seven men who had long worked in the White House travel office were suddenly and brutally fired. The seven nonpartisan government workers, who helped arrange presidential trips, served at the pleasure of the president. But each new president had kept them on because they were good at their jobs. A veteran civil servant named Billy Dale had worked in the office 30 years and headed it the last 10. He and his colleagues were ordered to clear out their desks and were escorted from the White House, which quickly announced they were the subject of a criminal investigation by the FBI. They were in shock. So were members of the press, who knew Mr. Dale and his colleagues as honest and professional. A firestorm ensued. Why so many stories? Because the real one wasn’t pretty. It emerged in contemporaneous notes of a high White House staffer that the travel-office workers were removed because Mrs. Clinton wanted to give their jobs—their “slots,” as she put it, according to the notes of director of administration David Watkins—to political operatives who’d worked for Mr. Clinton’s campaign. And she wanted to give the travel office business itself to loyalists. There was a travel company based in Arkansas with long ties to the Clintons. There was a charter travel company founded by Harry Thomason, a longtime friend and fundraiser, which had provided services in the 1992 campaign. If the travel office were privatized and put to bid, he could get the business. On top of that, a staffer named Catherine Cornelius, said to be the new president’s cousin, also wanted to run the travel office. In his book “Blood Sport,” the reporter James B. Stewart described her as “dazzled by her proximity to power, full of a sense of her own importance.” Soon rumors from her office, and others, were floating through the White House: The travel office staff were disloyal crooks. The White House pressed the FBI to investigate, FBI agents balked—on what evidence?—but ultimately there was an investigation, and an audit. All along Mrs. Clinton publicly insisted she had no knowledge of the firings. Then it became barely any knowledge, then barely any involvement. When the story blew up she said under oath that she had “no role in the decision to terminate the employees.” She did not “direct that any action be taken by anyone.” In a deposition she denied having had a role in the firings, and said she was unable to remember conversations with various staffers with any specificity. Billy Dale was indicted on charges including embezzlement. The trial lasted almost two weeks. Mr. Dale, it emerged, could have kept better books. The jury acquitted him in less than two hours. In the end he retired, as did his assistant. The five others were given new government jobs.